Below is my written Report from my investigation at Portchester Castle & St Marys Church. I have wanted to check out portchester castle for many years, After conducting some initial observations of the locations history and ghostly sightings – it was certainly a location that grabbed my interest for some observational field research. Portchester castle is an ancient location, with the first building was a fort constructed in 3AD, Which was built by the Romans. 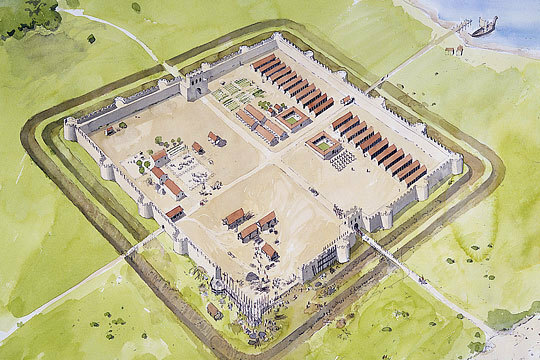 In the 5th century the fort became a Saxon stronghold against Viking raids, and in the 12th century a castle was built within the fort walls. Henry V’s in 1415 that culminated in his victory at Agincourt. Although increasingly overshadowed by Portsmouth across the water, Portchester remained occupied until the 17th century, and later served as a prisoner-of-war camp until the end of the Napoleonic Wars. The ghost of a monk dressed in a black robe and hood has been seen on many occasions in the castle grounds and is often seen walking around the outside of the castle walls. The apparition will often just fade away into the distance when he is seen. Witnesses have described the sightings as being mysterious, but not at all frightening. An English Heritage employee working at Portchester Castle reported seeing a spectral black horseman riding towards her late one summer evening inside the castle grounds. Sheila Sayce said that "As the apparition grew in size, it started to come towards me and I screamed and ran away. My colleague saw it too over my shoulder, it was a long, low, jet black shape with four legs and a horse's head, and it projected a very bad feeling". The following year a young boy came into the shop with a video for Sheila. He had been walking around outside the castle late one night and wanted to know if she could identify a strange sound on the tape. It was the sound of horse's hooves galloping on concrete. But of course, there were no horses anywhere to be seen outside of the castle. any locals and tourists have claimed to have seen the ghost of The White Lady, thought to be Charlotte White. During the Victorian era, Charlotte is said to have drowned in the moat surrounding Portchester Castle in an attempt to save her baby who had fallen in. Ever since, Charlotte's spirit has wandered the castle's grounds looking for revenge. Sightings of her ghost have often been reported alongside feelings that a malevolent spirit is present. Sometimes her ghost has been seen prowling the battlements before throwing herself from the Keep. In the UK, the legend of the White Lady of Portchester Castle, first built in the Third Century as a Roman fort on the present-day harbour of Portsmouth, persists. horseback is sometimes seen riding at ossified observers, its horse’s hooves even being captured on tape. The 12th Century church on the castle grounds continues to play host to paranormal activity as animal sacrifices continue to occur there. But the ghost that most haunts the castle is that of the motherly White Lady, Charlotte White. In Victorian times, Ms. White is thought to have thrown herself from the castle’s keep into the surrounding moat with the motive of saving her baby who had fallen into the moat. It was not the fall that killed her but the search for her child which drowned her. Today, visitors to the castle report seeing her phantom floating over its walls before jumping while feeling a general sense of evil in the air. Further Comments: The pale figure most commonly seen is thought to be Charlotte, though there are other reports of a monk who walks about outside the front of the castle, a Roman soldier, and a lady on the back of a white horse. As this was my first time visiting this location I wanted to view the whole location (outside walls and inside the ground) and went around taking lots of photographs from various angles, the whole place is beautiful so nice to photograph, and looking for key points of interest for the research I was conducting. I walked from the front entrance all the way around the side wall to the back wall were the ‘White Lady’ and ‘The Black Monk’ have been seen (also the sound of horse hooves). - When I got to the first tower (picture seen above) I had a rush of sadness come over me that was really powerful, I remember stopping and holding onto the tower for a few seconds, thinking to myself why am I feeling like this – I got out my 3axis EMF meter to measure for a potential EMF Hotspot, but was very flat other than ‘background noise’, so my feelings were not caused by EMF, at least not a source of EMF that my meter was capable of reading, once I kept walking around and when half way up the pathway the sadness left, i carried on and walked all the way to the front entrance and then went into grounds and headed straight for St Mary’s Church & Graveyard. I took a long walk around the entire graveyard looking for any signs of occult acts that might have been preformed there in the past, round the front of the church it was all very neat and there was nothing out of the ordinary, when I went to the back of the graveyard I found ‘The Labyrinth – Garden of Remembrance’ (pictured below) – The Labyrinth is for the burial of cremated remains. The symbol itself is an ancient spiritual symbol, it represents a spiritual pilgrimage to the heart of god. This seemed like a possible location for occult groups would commit their acts, but there was no evidence of it being conducted there. I sat around on a bench in front of the gravestone for a 30 minute session, with my digital recorder recording positioned on the gravestone, I asked a few questions but it was primarily an observational session. After I took some more photographs around the gravestone and I felt ‘Uneasy’ with the persistent feeling that someone was there watching me, I again had a deep feeling of sadness, it felt almost identical feeling to what was experienced earlier, but this time I could actually feel the water building up in my eyes. After I moved over to the Labyrinth, again sat on a bench in front of it with a recorder positioned on the labyrinth – another 30 minute session, nothing was experienced or captured so I decided to head back outside of the grounds and investigate the strange feelings of sadness I had earlier and also investigating the black monk and the white lady. I set up a HD Camera (1080p) facing from the tower (were I had the experience) recording the whole back-wall and part of the pathway, I also had my digital recorder positioned close to me for me to conduct a EVP session. - There was nothing experienced, I did not see anything but I think I might of found out a few causes for the ‘Horse hooves’ audio that was spoken about. During my observations of the back-wall I noticed when walking on the ‘stone’ pathway round the back-wall and into the ground, a sound that was a close match from the sound of a horse, if someone was wearing boots, walking on stones, with the echo made from the projection of the wall and water it could be mis-reviewed as a horse. - Also the boats in the water when the wind was hitting them they gave off an even closer match to the sound claimed, im not saying that these were the causes but they are possibilities. Whilst I was conducting my observations, the sun was really bright – reflecting of the water and lots of glares were happening and could easily be reviewed as a white figure, again I must stress that im not claiming this was the experience of the white lady, but it is certainly possible. I returned to the graveyard to end of the investigation this time I focused all my time on the Labyrinth and conducted a 1 hour EVP session and observational study. There was sadly nothing experienced or seen it was very peaceful, but for the last 10 minutes before I ended the investigation, my stomach felt sick which stayed with me until I left the castle grounds, and once I was walking away I felt very sad like I had 2 times earlier and a very cloudy head like I had just woke up. Unfortunately i have no analysed any of the photo/audio/video files from that day, but once all has been reviewed i will update this report with any results or conclusion after checking all data. Here is liitle interesting video that can change our mood if we are feeling tired by too much work for http://www.ukessayservicesreviews.com/ services and other jobs. So play it to have some fun and refresh your mind easily, you can share it with freinds also to give them smile. Well, I guess, that it will be better if you will be more concrete in your explanations. I can't get some of your points. I like to read about such paranormal investigations. that is really inyteresting for me. Is it feasible to obtain a keylogger on an iPhone? Completely, you're able to conveniently place a keylogger http://mobilenanny.org/iphone-keylogger/ on an iPhone with mSpy keylogger for apple iPhone. mSpy can be a fabulous monitoring computer software that provides keyloggers for iOs devices. It monitors each of the keystrokes typed around the iPhone, the browsing history and a lot more. You will find needless to say a couple of keyloggers available on the market, but mSpy iPhone keylogger most certainly stand out from it is competitors and is for certain legit. It is most important benefit would be the really good good quality, plenty of beneficial characteristics and user-friendly handle panel also as range of subscription plans. Due to this top rated apple iPhone keylogger you can easily very easily resolve any types of matters together with your companion, staff or youngsters. Ways to Opt for iPhone Spy Keylogger The very first thing you ought to do when picking the ideal iphone keylogger should be to concentrate mostly around the capabilities of your computer software as opposed to its value and recognition. Establish your desires initial and as quickly as you've got a clear vision of what application you in reality need to have, you could proceed with deciding upon the a single that suits you. It is quite painless to examine mSpy with other Apple iPhone keyloggers, there are many critiques and ratings readily available on the internet. I will definitely follow your points because it's a very important topic.Sometimes, The investigator will have to go abroad to handle the cases.You don't need any source to find investigator just visit https://www.dibailbonds.com/ to find your investigator.